In the third century BCE, Diogenes the Cynic famously insisted that a corpse was mere matter, fundamentally profane and profoundly irrelevant. To emphasize his point, Diogenes ordered that upon his death his own body should be tossed over the wall of the city and be left unburied. His friends were stunned. “What!” they replied. “To the birds and beasts?” “By no means,” he answered. “Place my staff near me, that I may drive them away.” “How can you do that, for you will not perceive them,” they responded. “How am I then injured by being torn by those animals, if I have no sensation?” he rejoined. Josse Lieferinxe, Saint Sebastian Interceding for the Plague Stricken (detail) (1497-99). The Walters Art Museum, Baltimore, Maryland. On 31 May 1578, laborers along the Via Salaria in Rome uncovered something mysterious in a nearby vineyard: a dark, forbidding hole that disappeared deep into the earth. Further investigation revealed the hole to be the entrance to an ancient, subterranean cemetery known as the Coemeterium Jordanorum, or Jordanian Cemetery. The discovery of other ancient cemeteries soon followed. Begun in the 1st century, these burial places were initially known as hypogaeum (a subterranean place) and later as coemeterium (a sleeping place). We, however, have come to know these Roman cemeteries by a different name: the Roman Catacombs. The cemeteries of the Roman Catacombs are linked by a multitude of galleries that cross and recross each other to form a vast labyrinth beneath the city. As J. Spencer Northcote and W. R. Brownlow explain in Roma Sotterranea, “The galleries are from two to four feet in width, and vary in height according to the nature of the rock in which they are dug. The walls on both sides are pierced with horizontal niches, like shelves in a bookcase or berths in a steamer, and every niche once contained one or more dead bodies.” Note that the Roma Sotterranea, published in 1869, states the niches “once contained one or more bodies.” In 1578, the bodies were still there. The Council of Trent, which met between 1545 and 1563, sought to address issues raised by Protestant reformers, including the preservation and veneration of holy relics. Ultimately, the Council reaffirmed the significance of relics, declaring that “they who affirm that veneration and honour are not due to the relics of saints; or, that these, and other sacred monuments are uselessly honoured by the faithful . . . are wholly to be condemned.” However, acknowledging that relics had been the subject of much abuse in the past, the Council also introduced strict rules governing their visitation and authentication. For example, the Council declared that in the veneration of relics, “every superstition shall be removed [and] all filthy lucre be abolished.” The Council also required all new relics to be officially recognized before they could be offered for veneration. While the Council’s decision provided a doctrinal resolution to the relic debate, many churches now faced a more practical problem: the Protestant Reformation had created a shortage of holy relics, particularly in areas close to Protestant regions. Given this scarcity, how would Rome meet the renewed demand for sacred relics? Where would churches find new relics for devotional display? The discovery of the Roman Catacombs seemed to provide a providential answer. Jean-Léon Gérôme, The Christian Martyrs’ Last Prayer (detail), oil on canvas (1863-883). The Walters Art Museum, Baltimore, Maryland. In his arresting book Heavenly Bodies: Cult Treasures & Spectacular Saints from the Catacombs, Paul Koudounaris notes that after their discovery in 1578, the dusky passageways of the catacombs became the focus of a “public obsession.” Koudounaris writes, “While no one was quite sure in the early years whose bones were down there, the consensus was that they must certainly be sacred because they dated from the blood-soaked days of state-sponsored persecutions.” In other words, it was believed the bones were those of early Christian martyrs. Soon, bones began to trickle northward as churches sought to replace relics lost during the Protestant Reformation with the bones of Katakombenheiligen or “catacomb saints.” These relics were officially authenticated, as required by the Council of Trent, although identification of could be tricky. As Koudounaris explains, relic hunters first looked for funerary plaques identifying martyrs, but “[i]f the word ‘martyr’ was absent, a capital ‘M’ was considered sufficient as shorthand—although ‘M’ was also used in Roman times as an abbreviation for the name Marcus, memoria (memory), mensis (month) or manis (dead).” Similarly, the abbreviation sang, or simply sa, were believed to mean sanguis (blood). In the absence of written clues, symbols were used to decipher the graves of martyrs. For example, the presence of a palm frond, long understood to be a symbol of martyrdom, could denote a martyr’s tomb. Alternatively, the presence of a phial or ampule was understood to mark the grave of a martyr because, it was believed, a sample of a martyr’s blood was commonly interred with the martyr’s body. Meanwhile martyrs lacking identifiable names were given new names in a process known as battezzati or “baptism.” Some were named after popular saints, such as Saint Boniface. Others were named in Latin after virtues, such as Constantius for constancy, Clemens for clemency, or Innocens for innocent. Churches treasured the relics they received from the catacombs, and they carefully prepared them for display in a manner befitting their stature. Full skeletons were especially prized, although reconstructing them correctly could be difficult. Koudounaris explains, “For extensive reconstruction, the bones would usually have to be sent to experts, most often to nuns who specialized in working with relics.” In addition to possessing the appropriate religious temperament to work with relics, these nuns also exhibited tremendous skill with textiles and the decorative arts. Once fully reconstructed, catacomb saints were lavishly decorated with gold, jewels, and sumptuous fabrics. According to Smithsonian Magazine, the bones were frequently wrapped in a fine gauze to prevent dust from settling on the relics and to use as “a medium for attaching decorations.” Additionally, “[l]ocal nobles often donated personal garments, which the nuns would lovingly slip onto the corpse and then cut out peepholes so people could see the bones beneath.” In some cases, a nun would add her own ring to a skeleton’s finger as a personal touch. The resulting displays were majestic, resplendent, regal—though a modern observer might describe them as creepy. Some catacomb saints wear wax masks over their brittle skulls. Others feature glass eyes or eye sockets beset with jewels. Many gesture as if still animate, suspended for a moment in time. The men and women whom the catacomb saints were meant to inspire, however, responded positively to these displays. They credited the skeletons with protecting their communities and working miracles on their behalf. Some named their children after them. And when they died, many wished to be buried near them. Waldauf Chapel, Pfarrkirche Sankt Nikolaus, Hall in Tirol, Austria. These skulls formed part of the collection of Florian Waldauf. Waldauf donated his collection to the church in 1501. Ultimately, caring for the catacomb saints—the “special dead” as Laqueur calls them—was “a sign of piety, of love, of affection, and of religious devotion.” It was “a mark of civility and decency: exactly what Diogenes rejected.” Saint Augustine had said, “The bodies of the dead, and especially of the just and faithful, are not to be despised or cast aside. The soul has used them as organs and vessels for all good work in a holy manner.” Buried for centuries before their discovery, the catacomb saints are proof that Diogenes was wrong, that dead bodies are not irrelevant, that the dead do matter. The catacomb saints were triumphs of the imagination invested with extraordinary meaning. And they were recalled to life just when the Church needed them most. Marcus Tullius Cicero, Tusculan Disputations (C.D. Yonge, trans, 1890), at 55-56. Thomas W. Laqueur, The Work of the Dead: A Cultural History of Mortal Remains (2015). J. Spencer Northcote and W. R. Brownlow, Roma Sotterranea (1869), at 29. As the authors explain in their preface, the book was based largely on Giovanni De Rossi’s two-volume Roma Sotterranea (1864, 1867), various articles from the Bullettino di Archeologia Cristiana, and other scholarly works and papers. John Calvin, Treatise on Relics (Valerian Krasinski, trans., 2008), at 55. See Koudounaris, supra note 7, at 30. Koudounaris observes that Clavin’s followers “proved particularly destructive. They sacked churches and ruined relics in large numbers, variously broken, discarded or set aflame.” Id. The Council of Trent: The Twenty-fifth Session (J. Waterworth, ed. and trans., 1848), at 234. Id. at 235. The Council also prohibited the visitation of relics “by any perverted into revellings and drunkenness.” Id. See Koudounaris, supra note 7, at 31. See, id. Koudounaris states, “The relic hunters who descended into the catacombs . . . were specifically seeking the graves of martyrs.” Id. Id. Koudounaris cites a 1907 study of catacombs saints in Switzerland to provide a sense of the scale of the exhumations. According to the study, Swiss churches alone possessed over 150 full skeletons and approximately 1,000 fragmentary collections of relics from the catacombs. Id. Rachel Nuwer, “Meet the Fantastically Bejeweled Skeletons of Catholicism’s Forgotten Martyrs,” Smithsonian Magazine, 1 October 2013, available at http://www.smithsonianmag.com/history/meet-the-fantastically-bejeweled-skeletons-of-catholicisms-forgotten-martyrs-284882/. Nuwer, supra note 34. Indeed in some cases, nearly half the children born in a town after the arrival of a catacomb saint would be named after the saint. Id. Laqueur, supra note 2, at 41. Id. (quoting Saint Augustine, De Cura Mortuum Gerenda, in Treatises on Marriage and Other Subjects (Roy J. Deferrari, ed., 1955) at 353). Whiles yet my soldiers are in my command; . . . If not, why, in a moment look to see . . . Though mentioned only briefly in the Bible, the Holy Innocents were eventually bestowed their own feast day sometime during the late 4th to late 5th centuries. Also known as Innocents’ Day or Childermas, the Feast of the Holy Innocents was once a day of role reversals, akin to the ancient Roman festival of Saturnalia, which placed children in authority over adults. Today, the Feast of the Holy Innocents, celebrated on 28 December, is a day of pranking and general tomfoolery similar to April Fools’ Day in some parts of the world. In the town of Ibi, Spain, for example, the festival of Els Enfarinats famously features a coup d’etat and a fierce battle of eggs and flour bombs that is waged throughout the town. Who were the Holy Innocents, though, and why were they massacred in the first place? According to the Golden Legend, “Herod was troubled when he heard of this, fearing that someone might have been born of the true royal line and might expel him as a usurper of the throne.” Nevertheless, perceiving an opportunity to discover the whereabouts of his potential challenger, Herod feigned interest in worshipping the new king and slyly asked the Magi to bring him news once they had found him. “Go and search carefully for the child,” he told them. “As soon as you find him, report to me, so that I too may go and worship him.” Herod had no intention of worshipping the child, however. Rather, he intended to kill the newborn king, quite literally in his infancy. In his study From Criminal to Courtier: The Soldier in Netherlandish Art, 1550-1672, David Kunzle explains that the Massacre of the Innocents became an increasingly popular subject in art in the 13th and 14th centuries. Over time, two “non-biblical, legendary embellishments” crept into depictions of the event, altering the way the massacre was perceived. The first, which lent “both realism and political edge” to such scenes, was the portrayal of mothers fiercely resisting the slaughter of their children. The second was the inclusion of Herod himself, callous and dispassionate amidst the carnage. Works by artists such as Cornelius van Haarlem and Peter Paul Rubens attempt to portray some of the confusion, anguish, and brutality that surrounded the massacre. In these depictions, the mothers of the Holy Innocents desperately interpose themselves between Herod’s soldiers and the helpless children of Bethlehem. They claw at the soldiers, tearing their faces and gouging their eyes. They frantically shield their children, but to no avail. Pale, lifeless corpses already litter the landscape. In contrast, Herod is commonly portrayed as a cold, detached observer of the events. Often, he is shown seated on a high throne,“ordaining the massacre.” The position, Kunzle argues, emphasizes Herod’s pride and arrogance. In Matteo di Giovanni di Bartolo’s The Massacre of the Innocents, for example, Herod is portrayed as a large figure with a crown, peering down from a throne from which he calmly directs the violence below. Sometimes, Herod is also depicted with counsellors, whose presence, Kunzle suggests, “gives the order to massacre the colour of a deliberate act of state rather than a furious personal impulse.” Herod has also been known to be accompanied by a pig. Reliquary Shrine with Scenes from the Life of Christ (detail), champlevé enamel on copper (c. 13th century), Walters Art Museum, Baltimore, Maryland. At right, Herod sits enthroned, his arm raised, while the devil whispers in his ear. “Those who kill, get killed,” Kunzle tells us. “Killers of sons get killed by sons.” Unsurprisingly, then, Herod’s barbarous order did not go unpunished. We learn from the Golden Legend that one of Herod’s infant sons had been “given to a woman in Bethlehem for nursing” and consequently was slain with the Holy Innocents during the massacre. On hearing this, the emperor August allegedly remarked, “I had rather be one of Herod’s pigs than sons.” Apparently, this comment inspired one 15th-century artist to insert a pig into a version of the Massacre of the Innocents. I am not aware of other such pigs loitering about similar depictions of the event, however. The Catholic Encyclopedia identifies a number of churches that purportedly possess relics of Holy Innocents. These churches include the Abbey of Saint Justina (Abbazia di Santa Giustina) in Padua, Italy; Saint Mary Major (Santa Maria Maggiore) in Rome, Italy; Lisbon Cathedral (Sé de Lisboa) in Lisbon, Portugal; and Milan Cathedral (Duomo di Milano) in Milan, Italy. The Basilica of Saint Paul Outside the Walls (Basilica Papale San Paolo fuori le Mura) in Rome also claims to possess relics of the Holy Innocents, and an apsidal mosaic in the church depicts five of the Holy Innocents as young boys, dressed in white, bearing palm branches. A curious monastery in Washington, DC, also lays claim to a link to the Holy Innocents, though not through relics like those of the churches described above. Descending into the fake catacombs of the Franciscan Monastery of the Holy Land in America, in the Brooklands neighborhood of Washington, DC, is slightly unsettling. After shuffling down a set of stairs and under an arch labeled “Nazareth,” one first encounters a gleaming, marble replica of the shrine of the Annunciation in Nazareth before continuing into the “catacombs.” The experience is perplexing, like drinking a German beer in the Germany Pavilion at Disney’s Epcot Center. Still, there is a certain allure to place. It is air-conditioned and dust-free, and not particular creepy—until one happens on the body of a small boy, encased in glass, resting serenely on red silk cushions. The boy is crowned with a golden wreath, above which hovers a golden halo. His head is tilted slightly to the right and a gentle smile plays across his pale, waxen face. He wears a white silken tunic, which is bejeweled around the neck, and a red ribbon hangs loosely about his waist. His hands and feet are covered in golden gauze, and his left hand, crumpled loosely into a fist, rests atop his body cradling a palm branch. Saint Innocent’s hands are visible through the gauze covering his hands. The palm frond tucked beneath his left hand is a symbol of martyrdom. Saint Innocent is not a Holy Innocent, but he serves as a representative of all those who, as the Golden Legend states, were “innocent in their lives and upright in faith.” Recognizing this symbolic connection, another sign above Saint Innocent’s reliquary reminds visitors that December 28th is the Feast of the Holy Innocents, a day of remembrance of Christianity’s young, first martyrs. William Shakespeare, Henry V, III, iii, 27-41. Jacobus de Voragine, 1 The Golden Legend: Readings on the Saints 56 (William Granger Ryan trans., 1993). The feast is first mentioned in the Leonine Sacramentary of about 485. Golden Legend, supra note 2, at 57. David Kunzle, From Criminal to Courier: The Soldier in Netherlandish Art 1550-1672 (2002), at 35. Kunzle, supra note 9, at 46. Painted circa 1480-1490, the work is located at the Museo di Capodimonte, Naples, Italy. Kunzle, supra note 9, at 42. Golden Legend, supra note 2, at 58. Kunzle, supra note 9, at 40 (quoting Macrobius). However, this quip may relate to a different event altogether. The Golden Legend states Augustus made these remarks after learning that Herod had deliberately ordered the death of two of his sons. In response, the Golden Legend quotes Augustus as saying, “I would rather be Herod’s swine than his son, because he spares his swine but kills his sons.” Golden Legend, supra note 2, at 58. Kunzle, supra note 9, at 40-41. See, e.g., Albrecht Classen, Childhood in the Middle Ages and the Renaissance: The Results of a Paradigm Shift in the History of Mentality 123 (2005) (“The Holy Innocents became the first Christian martyrs because of their chronological and geographical proximity to Christ and because they died in his stead.”); Rosa Giorgi, Saints in Art 167 (Stefano Zuffi ed. & Thomas Michael Hartmann trans., 2002). 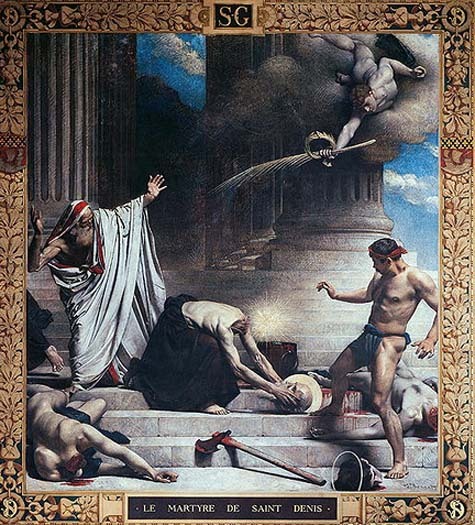 In Ruben’s Massacre of the Innocents at the Alte Pinakothek in Munich, Germany, angels from heaven tumble to earth bearings crowns of martyrdom instead. 7 Catholic Encyclopedia 420 (Charles G. Herbermann et al., eds 1910). The verse from Revelation cited in the text above reads, “And they sung as it were a new song before the throne, and before the four beasts, and the elders: and no man could learn that song but the hundred and forty and four thousand, which were redeemed from the earth.” Revelation 14:3. Giorgi, supra note 23, at 167. Golden Legend, supra note 2, at 56. One of the more remarkable relics on display in the Reliquary Treasury of Dubrovnik Cathedral is the “diaper” of Jesus. The relic is displayed in a bulky silver reliquary, profusely ornamented with winged figures, clunky arabesques, and other decorative accents. While most translations into English describe the relic as a “diaper” or “diapers,” it could more accurately be described as the “swaddling cloth” or “swaddling clothes” of Jesus. Veneration of Jesus’ swaddling clothes is more frequently associated with Aachen, Germany, where a more famous set of swaddling garments has been kept since the 13th century. Housed in the golden Shrine of Saint Mary (Marienshrein) at Aachen Cathedral, the swaddling clothes (Windel Jesu) were rarely put on public display prior to the 14th century. Since then, the relic has been exhibited in Aachen approximately every seven years. In comparison, the swaddling clothes kept at Dubrovnik Cathedral are regularly displayed in the cathedral’s astonishing treasury of saintly relics. In a paper on Jesus’ swaddling clothes, Sophie Oosterwijk explains that since antiquity, “medical tradition held that the newborn child might develop deformed limbs if left unswaddled; therefore, swaddling clothes were considered absolutely essential not just for ordinary infants but also for the Christ child.” Consequently, until about the 14th century, depictions of the Nativity commonly showed the infant Jesus tightly swaddled, his face serene in a cloth cocoon. Some paintings of this period, however, show the infant Jesus unswaddled, presumably mere moments after his birth. According to one tradition, Jesus’ struggling parents were forced to reuse Joseph’s hose, the only extra cloth they had at hand, as makeshift swaddling clothes. Paintings inspired by this story frequently portray Joseph removing his shoes and stockings or ripping his hose into strips as Mary waits nearby. “Mary, take my hose and wind your dear baby in them,” Joseph tells Mary in an early 15th century Nativity painting from a church in Lezignan. In another, Joseph seated on the ground with one bare foot extended, carefully cuts his hose into strips with a knife while a recumbent Mary watches from a mattress. Rogier van der Weyden’s famous Columba Altarpiece has also been tied to this tradition, though Joseph’s stockings are portrayed more subtly: two squares of cloth laid in Jesus’ manger have been interpreted as Joseph’s repurposed hose. Joseph Malouel?, Nativity, oil on tempera (c. 1400), Museum Mayer van den Bergh, Antwerp, Belgium (courtesy Wikimedia Commons). Here, Joseph can be seen cutting one of his stockings with a knife as Mary watches and the infant Jesus waits in a manger. Adoration of the Magi (panel detail), Columba Altarpiece, oil on oak (c. 1455), Alte Pinakothek, Munich, Germany. The two squares of cloth padding the manger at left have been interpreted as Joseph’s hose. A curious book titled Excrement in the Late Middle Ages further explores the history and deeper theological meaning of Jesus’ swaddling clothes. As the author, Susan Signe Morrison, notes, while stories about the baby Jesus’s swaddling clothes may seem “obscene or blasphemous,” they were, in fact, “produced within the confines of the sacred.” Miracles associated with Jesus’ swaddling clothes were described in the First Gospel of the Infancy of Jesus Christ — a work condemned as heretical in the fifth century — and in stories describing the return of the Wise Men to their home countries. See, e.g., Ante Dračevac, La Cathedrale de Dubrovnik 50 (Françoise Kveder trans., 1988). Dating to the 16th century, the reliquary is the work of local Dubrovnik metalsmiths. Id. For example, an older guide to the cathedral, translated into French and no longer in print, describes the relic as “des langes de Jésus.” Id. Joan Carroll Cruz, Relics 23 (1984). Sophie Oosterwijk, The Swaddling-Clothes of Christ: A Medieval Relic on Display, 13 Medieval Life 25-30 (2000). Incidentally, Saint Joseph’s hose is also purportedly stored in the Marienshrein, along with Jesus’ swaddling clothes, the robe of Saint Mary, and the beheading cloth of Saint John the Baptist. Photographs of all four relics, which comprise the four great relics of the Marienschrein, can be found here. Gail McMurray Gibson, “St. Margery: The Book of Margery Kempe,” in Equally in God’s Image: Women in the Middle Ages 152 (Julia Bolton Holloway et al., eds., 1990). The painting is the Nativity panel of a polyptych by an unknown artist, possibly Jean Malouel, painted c. 1400. See, e.g., Oosterwijk, supra note 5, at 28. Susan Signe Morrison, Excrement in the Late Middle Ages: Sacred Filth and Chaucer’s Fecopoetics 92 (2009). The Alba Madonna, Rafael, oil on panel transferred to canvas (1510), National Gallery of Art, Washington, D.C. In his superb book on Christian symbolism, Signs and Symbols in Christian Art, George Ferguson writes, “No other figure, except that of Christ Himself, was so often portrayed in Renaissance art as the Virgin Mary.” Ferguson further notes that Saint Mary was traditionally painted wearing blue, the color of truth and a symbol of the sky, heaven, and heavenly love. But did the historical Saint Mary actually wear blue? Evidence preserved in various shrines suggests the Virgin’s blue wardrobe may have been an invention of Medieval and Renaissance artists. These artists expressed their devotion to the Virgin by using a very scarce and very expensive pigment to paint her garments. The pigment, known as ultramarine, was a deep, celestial blue. Madonna and Child with Saint Jerome and Saint John the Baptist, Cima da Conegliano, oil on panel (1492-1495), National Gallery of Art, Washington, D.C. The Marienschrein, or Shrine of Saint Mary, at Aachen Cathedral in Aachen (Aix-La-Chapelle), Germany houses four great relics: the cloak of Saint Mary, the swaddling clothes of the infant Jesus, the beheading cloth of Saint John the Baptist, and the loincloth worn by Jesus at his crucifixion. The relics were rarely displayed publicly before the 14th century; however, since about the mid-14th century, the relics have been removed from the shrine approximately every seven years for public veneration. The Madonna of the Stars, Jacopo Tintoretto, oil on canvas (second half of the 16th century), National Gallery of Art, Washington, D.C. Example of ultramarine pigment, Albrecht-Dürer-Haus, Nuremberg, Germany. The deep, rich ultramarine prized by the artists of the Renaissance derived from lapis lazuli, an intensely blue, semi-precious stone found in only a few places on Earth. For artists such as Michelangelo, Titian, and Dürer, the only source of ultramarine was Afghanistan, a “mythical land so far away that no European . . . had actually been there.” Finlay notes that ultramarine was once “the most valuable paint material in the world,” and artists such as Michelangelo would have had to wait for their patrons to procure it for them because they could not afford it on their own. Given its tremendous cost and unquestionable rarity, then, it is not surprising that so many artists chose to clothe the Virgin Mary in ultramarine. Fortuitously, ultramarine also happens to be a serene and majestic color, one truly appropriate for the Queen of Heaven. [UPDATE, 27 JUNE 2014.] The following description is from the Aachen Pilgrimage 2014 (Heiligtumsfahrt 2014) website: “St. Mary’s robe is an ancient work of domestic embroidery. . . . It is made of naturally coloured linen and is embroidered with vertical and horizontal lines in a grid pattern. In Israel flax and cotton were only to be found on the coast and in the lowlands of Jordan . . . .” The website further notes that the dress is 153 cm long; the seam circumference is 246 cm; and the span of the sleeves is 132 cm. The Aachen Pilgrimage 2014 homepage can be found here. More information about the cloak of Saint Mary can be found here. A picture of the robe can be viewed here. Madonna and Child, Vittore Carapaccio, oil on panel (1505-1510), National Gallery of Art, Washington, D.C.
Madonna and Child, Jan Gossaert, oil on panel (c. 1532), National Gallery of Art, Washington, D.C.
Virgin and Child, sandstone with traces of polychrome (c. 1325-1350), Rijksmuseum, Amsterdam, Netherlands. Madonna and Child, stained-glass window, Strasbourg Cathedral, Strasbourg, France. Aachen Cathedral with High Altar and Pala d’Oro in foreground and Marienschrein (Shrine of Saint Mary) behind. Hanging from the vault above the choir is a wooden medallion of the Madonna and Child carved by Jan van Steffesweert of Maastricht in 1524. George Ferguson, Signs and Symbols in Christian Art 71 (1954). John Carroll Cruz, Relics 23 (1984). Victoria Finlay, Color: A Natural History of the Palette 317 (2002). Saint Blaise Group, Dom St. Blasien (Cathedral of Saint Blaise), St. Blasien, Germany. This statute group, which depicts Saint Blaise performing his most famous miracle, dates to circa 1740. It originally stood in an Ursuline monastery in Vienna. For over a thousand years, the city of Dubrovnik, Croatia has celebrated the feast day of Saint Blaise by staging one of the grandest and most impressive annual festivals in the world: the Festivity of Saint Blaise (Festa svetoga Vlaha). The festival commemorates Saint Blaise’s salvation of the city on the eve of a surprise attack in 971. According to tradition, Saint Blaise’s miraculous intervention thwarted a planned invasion of the city, and in gratitude, the people of Dubrovnik enthusiastically embraced the saint’s cult, proclaiming him their patron and protector. Over the centuries, the relationship between city and saint flourished, and the identities of both became virtually inextricable. The annual Festivity of Saint Blaise, which has been celebrated in some form since at least 1190, only reinforced this association. Meanwhile, succeeding generations have adapted the festival to their own needs, which has kept it vibrant and relevant in changing times. Today, Saint Blaise’s likeness can be found virtually everywhere in Dubrovnik, and his spirit continues to imbue the city with a touch of mystery and a sense of the sublime. Dubrovnik, Croatia. View of the rooftops with the Church of Saint Blaise in the foreground. Acknowledging its great historical and cultural significance not only to the people of Dubrovnik, but also to the people of the world, UNESCO formally recognized the Festivity of Saint Blaise as an example of the Intangible Cultural Heritage of Humanity in 2009. Who, though, was Saint Blaise? And how did he come to save Dubrovnik from disaster? The night of February 2, 971, began quietly enough in city of Dubrovnik. It was Candelmas, the feast of the Presentation of Jesus at the Temple. A fleet of Venetian ships lay at anchor beyond the city walls, taking on provisions before continuing east. And the city’s pastor, a man named Stojko, was out for a walk. As Stojko approached the church of Saint Stephen that night, he noticed something odd: the doors to the church had been left wide open. Stojko entered the darkened church and discovered an old, gray-haired man who introduced himself as Saint Blaise, the 4th-century bishop and martyr of Sebaste. Saint Blaise gravely explained the reason for his visit. “I come to warn you of great danger for the city,” he said. The Venetians anchored outside the city walls had arrived under pretext, and they intended to take the unsuspecting city, a flourishing commercial power and potential rival to Venice, by surprise. Alarmed by Saint Blaise’s message, Stojko rushed to the city council and warned them of the impending attack. The gates to the city were quickly secured, and the mighty walls of the town were manned for the city’s defense. Seeing these preparations, the Venetians abandoned their plans and departed, leaving Dubrovnik – then known as Ragusa – in peace. Significantly, the next day, February 3rd, was the feast day of Saint Blaise. Today, the Festivity of Saint Blaise is celebrated over the course of several days, although preparations for the festival begin many weeks in advance. The Festivity officially opens with much fanfare on Candlemas, February 2nd, when the banner of Saint Blaise is raised atop Orlando’s Column in front of the Church of Saint Blaise. (Orlando’s Column, also known as Roland’s Column, commemorates the knight and hero of the famous medieval poem The Song of Roland (La Chanson de Roland), who died in the service of the emperor Charlemagne at the Battle of Roncevaux in 778.) The raising of the banner – a white standard embroidered with an image of Saint Blaise as a gray-haired bishop – is accompanied by the ringing of church bells, the discharging of historic firearms, and the release of white doves. Joyous shouts of “Long live Saint Blaise!” follow from the cheering crowd. In the evening, Vespers to honor Saint Blaise are sung in the cathedral. The festival resumes early the next morning, the official feast day of Saint Blaise, with the ringing of church bells, the clamor of brass bands, and more volleys from thecity’s historic musketeers, the trombunjeri. About mid-morning, a public mass is held outside Dubrovnik Cathedral (Cathedral of the Assumption). At its conclusion, a grand procession of celebrants – including trombunjeri, banner-bearers, priests, nuns, musicians, First Communicants, pilgrims, residents in national costumes, and specially appointed festanjuls (celebrators) – wends its way from the cathedral down the Stradun, the city’s main thoroughfare, and through the heart of the Old City. The procession is one of the most colorful and most striking elements of the festival. In the words of one book on Saint Blaise, “the Stadun becomes a magnificent cathedral under the open skies” during the procession. One of the highlights of the parade includes the procession and display of Dubrovnik’s most prized relics, including the head, right hand, foot, and throat of Saint Blaise. Housed in glittering reliquaries of gold and silver, the relics have been described as the “greatest cultural and artistic treasure” of Dubrovnik Cathedral. The Reliquary of the Head of Saint Blaise is shaped like a Byzantine crown and likely dates to the 11th century. The Reliquary of the Right Hand of Saint Blaise is slightly more modern. Crafted in the 12th century by Dubrovnik goldsmiths, the reliquary is shaped like a hand and features a large blue stone surrounded by filigree, pearls, and precious stones embedded on the back of the hand. The Reliquary of the Foot of Saint Blaise, like the hand reliquary, is a “speaking reliquary.” Crafted by Byzantine goldsmiths in the 11th century, the reliquary is shaped like a leg and foot and is covered in intricate gold filigree. The Reliquary of the Throat of Saint Blaise contains the saint’s larynx, which is visible through a crystal window. Shaped like a monstrance, the reliquary is made of embossed silver decorated with enamel and dates to the 15th century. Lastly, the Diapers or Swaddling Clothes of Jesus, housed in an ornate silver chest, are given a place of honor in the parade. According to tradition, Saint Blaise was a 4th-century bishop of Sebaste in Armenia who was martyred in approximately 316. He was born to a wealthy Greek or Armenian family in about 280, and he studied medicine, which he practiced with great skill and gentleness. After treating his patients, he often added a sign of the cross. During a persecution of Christians in the region, Saint Blaise withdrew to a cave on Mount Argeus. The cave was frequented by wild beasts, which Saint Blaise healed when they were sick or wounded. Hunters sent to the mountain to obtain wild animals for the amphitheater eventually discovered Saint Blaise, surrounded by the animals, and “though greatly amazed, they seized him and took him to Agricola,” the Roman governor of Cappadocia and Lesser Armenia. En route, Saint Blaise performed a number of miracles in the presence of the hunters. Fountain Statute of Saint Blaise, Domplatz (Cathedral Square), Dom St. Blasien, St. Blasien, Germany. The statue was carved by Josef Schupp in 1714. The fountain was designed by Walter Schelenz in 1966. First, the group encountered a poor woman whose pig had been seized by a wolf. Saint Blaise commanded the wolf to return the pig, and the wolf immediately complied, returning the unfortunate animal unhurt. For this act, Saint Blaise gained a reputation as a protector of pigs and of animals more generally. Second, Saint Blaise healed a sick boy who was choking on a fishbone. The boy was at the point of death when his mother brought him to Saint Blaise. Saint Blaise placed his hands on the boy’s throat, prayed to God, and healed him. On account of this miracle, Saint Blaise has since been invoked as a protector against throat illnesses, including sore throats, and other associated maladies, such as tonsillitis (also known in Spain as the curse of Saint Blaise) and respiratory problems. When Saint Blaise was finally presented before Agricola, Saint Blaise refused to deny his faith. Consequently, he was imprisoned without food and was scourged. During his imprisonment, the woman whose pig Saint Blaise had saved brought him food and gave him candles to lighten his gloomy cell. Candles would later become a common attribute of Saint Blaise. Crossed in an X either against the throat or over the head of an applicant, two candles are used to deliver the traditional Blessing of the Throat and are said to recall the tapers brought to the saint by the grateful woman. The prayer that accompanies the Blessing of the Throat is Per intercessionem Sancti Blasii liberet te Deus a malo gutturis et a quovis alio malo (“Through the intercession of Saint Blaise, may God deliver you from illness of the throat and every other illness”). Eventually, Agricola had Blaise tortured and scourged with iron carding combs, which scraped and tore his flesh. Because carding combs are also used to card wool, Saint Blaise’s association with these instruments of torture oddly led to his adoption as the patron saint of wool combers. Additionally, because the iron combs viciously shredded his skin, Saint Blaise also became a protector against skin ailments, such as blisters, pimples, and leprosy, which was much feared during the Middle Ages. Saint Blaise depicted above a city gate, Dubrovnik, Croatia. After these tortures, Saint Blaise was beheaded and was buried near the walls of Sebaste. He is commonly portrayed as a bishop with a gray or white beard, and he is often shown holding a crosier, an iron comb, or candles. In Dubrovnik, he frequently holds a miniature version of the city in his hands. Saint Blaise is also a member of the Fourteen Holy Helpers or Vierzehn Nothelfer (“fourteen helpers in need”), which has been described as “a potent group of saints invoked collectively in times of near death or dire calamity.” Veneration of the Fourteen Holy Helpers originated in Germany in approximately the 13th century, though the cult did not gain a wide following until the 15th century, when a shepherd declared seeing the Christ Child accompanied by fourteen older children near the Benedictine Abbey at Banz. According to the shepherd, the Christ Child described his companions as the Nothelfer and stated that they wished to work miracles from the site. A small chapel was built on the spot, though it was later replaced by a much grander pilgrimage church, the Wallfahrkirche Vierzehnheilgen, designed by Balthasar Neuman. Živio sveti Vlaho! Long live Saint Blaise! In Dubrovnik, at least, tradition and faith endure. The Festivity of Saint Blaise is proof that Saint Blaise has not been forgotten and remains integral to the life and culture of the city. Živio sveti Vlaho! Interior Dome of the Dom St. Blasien, St. Blasien, Germany. The ceiling frescoes are by Walter Georgi. See, e.g., Nomination for Inscription on the Representative List 2009: The Festivity of Saint Blaise, the Patron of Dubrovnik, Intergovernmental Committee for the Safeguarding of the Intangible Cultural Heritage, 2 Oct. 2009; Thousand Year Old Celebration of the Dubrovnik Patron, St Blaise, Dubrovnik Tourist Board Website, Feb. 3, 2012, http://visitdubrovnik.hr/en-GB/Events/Event/Town/Dubrovnik/Thousand-Year-Old-Celebration-of-the-Dubrovnik-Patron-St-Blaise?ZXZcNjUz; Saint Blasius Church–Dubrovnik, DubrovnikCity.com, http://www.dubrovnikcity.com/dubrovnik/attractions/st_blaise_church.htm. See The Festivity of Saint Blaise, the Patron of Dubrovnik, UNESCO.org, http://www.unesco.org/culture/ich/index.php?RL=00232. Other sources claim the festival is much older. Saint Blaise: Veneration Without Boundaries 105 (Adriana Kremenjaš-Daničić ed., Biserka Simatović trans., 2012). Saint Blasius Church–Dubrovnik, supra note 1. Fans of the television show “Game of Thrones” may recognize the stout defensive walls of Dubrovnik. Dubrovnik has doubled as King’s Landing and Qarth in various episodes of the popular show. See Natasha Geiling, On the Ultimate “Game of Thones” Tour, Apr. 10, 2014, Smithsonian.com, http://www.smithsonianmag.com/travel/iceland-croatia-go-ultimate-game-thrones-tour-180950450/?no-ist. The Venetians would eventually conquer Dubrovnik, also known as Ragusa, centuries later. A lectures series called “In Expectation of Saint Blaise” held in January marks the beginning of the preparations for the festival. Europski Dom Dubrovnik, Saint Blaise: Veneration Without Boundaries 107 (2012). Musketeers known as trombunjeri are responsible for firing the volleys that accompany the raising of Saint Blaise’s banner. See, e.g., id. ; Nomination for Inscription on the Representative List 2009, supra note 1. Saint Blaise: Veneration Without Boundaries, supra note 9, at 107. See, e.g., Saint Blaise: Veneration Without Boundaries, supra note 9, at 107; Nomination for Inscription on the Representative List 2009, supra note 1. See Saint Blaise: Veneration Without Boundaries, supra note 9, at 108. See, e.g., Nomination for Inscription on the Representative List 2009, supra note 1 (“Priests in the procession carry many saintly powers in reliquaries, an exceptional cultural and historical treasure, which mostly contains the relics of Blaise and the holy martyrs from the first centuries of Christianity.”). The Dubrovnik Cathedral (Don Stanko Lasić ed., n.d.) (pamphlet describing Dubrovnik Cathedral). See, e.g., Tom Kelly, A Party for the Patron Saint of Sore Throats, Telegraph (UK), Jan. 27, 2007, available at http://www.telegraph.co.uk/travel/destinations/europe/croatia/739995/A-party-for-the-patron-saint-of-sore-throats.html. The author mistakenly identifies the relic as “a fragment of Jesus’s loincloth.” In fact, the silver reliquary is said to contain the diapers or swaddling cloths of the baby Jesus. See, e.g., 1 Butler’s Lives of the Saints 239 (Herbert J. Thurston, S.J. & Donald Attwater eds., 2d ed. 1956); Saint Blaise: Veneration Without Boundaries, supra note 9, at 10–16. Saint Blaise: Veneration Without Boundaries, supra note 9, at 13. Butler’s Lives of the Saints, supra note 21, at 239. Saint Blaise: Veneration Without Boundaries, supra note 9, at 13; see also Butler’s Lives of the Saints, supra note 21, at 239. Saint Blaise: Veneration Without Boundaries, supra note 9, at 14, 17. Saint Blaise: Veneration Without Boundaries, supra note 9, at 17. Henry Wadworth Longfellow, Complete Poetical Works (1893). During the Middle Ages, few individuals did more to support and develop the arts than Saint Bernward of Hildesheim. Considered one the era’s greatest patrons of the arts,1 Saint Bernward’s legacy included the commissioning of Hildesheim Cathedral’s monumental bronze doors2 and the construction of the abbey church of Saint Michael in Hildesheim.3 At a recent exhibition at the Metropolitan Museum of Art in New York, a number of objects commissioned by Saint Bernward, as well as other important objects from the treasury of Hildesheim Cathedral, were on display. The exhibition included several reliquaries, including a skillfully fashioned reliquary containing the skull of Saint Oswald and an arm reliquary that once held relics of Saint Bernward himself. Cross Reliquary, gilded silver, rock crystal, and semiprecious stones, Hildesheim, Germany (c. 1180-1190), Hildesheim Cathedral, Hildesheim, Germany. A reliquary cross containing relics of the Holy Cross was also on display. According to legend, Henry the Lion, duke of Saxony and Bavaria obtained the relics from the Byzantine emperor in Constantinople during a pilgrimage to Jerusalem. On his safe return to Saxony in 1173, Henry allegedly donated the relics to the Church of the Holy Cross in Hildesheim, although no records supporting this story appear to exist.8 Nevertheless, the reliquary cross’s opulent gilding and intricately hammered ornamentation, as well as its impressive array of colored gems and rock crystal, attest to the significance of the darkened slivers of wood nestled at the center of the cross. Church of Saint Donatus, Zadar, Croatia. The church of Saint Donatus is located across the street from the convent of Saint Mary and the Permanent Exhibition of Religious Art. In his superb study on relics, Holy Bones, Holy Dust, Charles Freeman argues that arm reliquaries sometimes served an additional purpose beyond that of mere identification. Freeman notes that after Mass, celebrants traditionally blessed their congregations before they departed.25 Freeman writes that a blessing given by a bishop “was of a much higher status [than] that by a mere priest, and congregations often felt they had been badly done by. Yet if a priest held up an arm reliquary and blessed the congregation with that, it was believed to have the same effect as if the bishop himself had been there.”26 The posture of the Arm Reliquary of Saint Bernward—its right index finger and middle finger extended to heaven, its thumb curled slightly inward—suggests that it may occasionally have been used for this purpose, to deliver the final blessing. Another arm reliquary in the permanent collection of the Metropolitan Museum of Art, the Arm Reliquary of Saint Valentine, likely served a similar function. Army Reliquary of Saint Valentine, silver, gilded silver, and blue cabochon, Basel, Switzerland (c. 1380-1400), Metropolitan Museum of Art, New York. Cross Reliquary (detail), gilded silver, rock crystal, and semiprecious stones, Hildesheim, Germany (c. 1180-1190), Hildesheim Cathedral, Hildesheim, Germany. Small Bernward Cross, copper alloy, gilding, and semiprecious stones, Hildesheim, Germany (c. 1170-1180), Hildesheim Cathedral, Hildesheim, Germany. Reliquary Cross (detail), silver, gilded silver, enamel, coral, and rock crystal, Italy (the Marches), c. 1375-1400, Metropolitan Museum of Art, New York. This reliquary cross from the late 14th century is part of the permanent collection of the Metropolitan Museum of Art. Slivers of wood can still be seen encased at the center of the cross. 1 Metropolitan Museum of Art, Medieval Treasures from Hildesheim 6 (Peter Barnet et al. eds., 2013). 2 Id. at 11. According to Medieval Treasures from Hildesheim, the casting of Bernward’s enormous and highly decorated bronze doors, now known as Bernward’s Doors, was “a technological breakthrough for the Middle Ages and a milestone in the history of art.” Id. 5 Id. at 14, 16. 10 Id. Medieval Treasures from Hildesheim further notes that other monumental crucifixes similarly served as reliquaries. 13 Id. Examples of this reuse can be found at Prague Cathedral and Saint-Denis in Paris. 14 Charles Freeman, Holy Bones, Holy Dust 63 (2011). 15 Saint Bede, The Venerable Bede’s Ecclesiastical History of England 123 (J. A. Giles ed., 1847). 20 Saint Bede, 1 The Complete Works of Venerable Bede: Life, Poems, Letters, Etc. at xcviii, xciii (J. A. Giles trans., 1843); Thomas J. Craughwell, Saints Preserved 228–29 (2011). 21 Craughwell, supra note 20, at 229. 23 Freeman, supra note 14, at 82. 24 The Permanent Exhibition of Religious Art is also more informally known as the “Gold and Silver of Zadar.” Located in the Benedictine convent next to the church of Saint Mary, the exhibition includes an overwhelming and truly extraordinary collection of relics and other sacred objects, the oldest of which—a small pectoral cross—dates from the 8th century. See Ivo Petricioli, The Permanent Exhibition of Religious Art in Zadar at VIII (2004). According to Michelin, the museum itself is “[o]ne of the best museums in Croatia.” Sacred Art Museum, Michelin Travel, http://travel.michelin.com/web/destination/Croatia-Zadar/tourist_site-Sacred_Art_Museum-Trg_Opatice_Cike. The Reliquary of the Shoulder Blade of Saint Mark, which is fashioned of embossed gilded copper metal plate, is estimated to date to the 13th century. 27 Medieval Treasures from Hildesheim suggests that the original structure of the church may have been preserved over the centuries “because Bernward’s sainthood and supposed involvement as an architect and artist gave St. Michael’s itself the status of a relic.” Metropolitan Museum of Art, supra note 1, at 7.